and the details of how royalties are collected and distributed both in Ireland and abroad. (iv) 1 vote on a show of hands: 50 votes on a poll or postal ballot plus 50 additional votes if either of the under-noted criteria is fulfilled(3) (5). 1. Discretion is retained by the Board of Directors to elect below the criteria in appropriate circumstances. 2. Promotions to Full and Associate membership are automatic. After the end of each financial year, members’ earnings are examined to determine those who qualify for promotion. They are then notified of their new member status. The new status is not lost by any subsequent decline in IMRO earnings below the level of current criteria. 3. Successors to deceased members are eligible for promotion to Full membership if they meet the same earnings criteria as publisher members. However, successors are not eligible for appointment to the Board of Directors, nor are they entitled to the fifty additional votes on a poll or postal ballot (note 5) unless also qualifying for Full membership as a writer or publisher in their own right. 4. The earnings criteria shown above are for promotions from 1996 onwards. They will be reviewed every five years. 5. To qualify for additional Full Member Votes, a member must have aggregate IMRO or IMRO and previous PRO earnings of 10 times the full membership criterion as at the preceding 31st December, during the 20 years or less up to the preceding 31st December. The earnings required are €63,486.90 (writer) and €253,947.60 (publisher). c) performed in public on at least 12 occasions within the past two years. d) A classical composer whose work has been performed live at a concert or recital of classical music licensable by IMRO. Applications for IMRO membership should be accompanied by suitable evidence such as a copy of the commercial recording, a letter / email from the broadcaster confirming that the broadcast took place or confirmation in a letter / email from the venue manager/owner or promoter that the qualifying performances took place. Each applicant must also submit proof of identity in the form of a photocopy of a birth certificate, passport or driver’s licence. a) The writers of the 10 qualifying works must be members of IMRO, or of one of its affiliated societies. b) The publisher must have acquired rights in at least 5 of the works for a territory within the European Union. A copy of the recordings or of the sheet music must be submitted in support of the application for the qualifying 10 works. Copies of all assignments between the applicant and the writers in respect of the works concerned must also be supplied. A sheet of the publisher’s headed notepaper should be provided. Individual applicants must also submit a copy of their birth certificate, passport or drivers licence. There is no fee for IMRO membership for either writer or publisher applicants. ‘Broadcast’ means transmission by a television or radio broadcasting station and/or inclusion in a cable programme. ‘Film’, which includes videograms (whether in the form of cassettes or discs) as well as cinematograph films as defined in Section 18 of the Copyright Act 1963. (iv) the work has been recorded on the soundtrack of a film which has been released for public exploitation. Provisional and Associate writer membership may be terminated if no royalties at all are credited to the writer over a five year period. Provisional publisher members whose royalties have not exceeded an aggregate of €317.43 over five years may also be terminated. Copyright in musical works lasts for the lifetime of the author (or in the case of co-written works, the lifetime of the last surviving contributor) and for 70 years following their death. On the death of a member, IMRO should be notified as soon as possible so that it can be established to whom future royalties should be paid. Under the company’s Articles of Association membership of IMRO ceases upon death. IMRO will continue to pay royalties to the deceased members’ executors until December 31st of the seventh year following their death, or until a successor member is admitted, whichever is the earlier. IMRO will admit to Successor membership persons eligible under the Articles of Association. Admission is carried out in such a way as to cause the royalties to be paid in accordance with the will or operation of law. Whatever arrangements are made, IMRO is strictly accountable to pay royalties to the executors in the first instance and then to the Successor member, if one is elected. If the deceased does not leave a will, the law prescribes who is to inherit his or her assets, including royalty payments from IMRO. IMRO is bound by the law. Therefore, in the absence of a valid will all royalties will be paid to those legally entitled. The legal charges for making a will are quite small, and IMRO strongly advises that members make a will and recommend that a solicitor should be consulted as this is not always a straightforward process. Successors to Provisional members are initially admitted to Provisional membership, whereas Successors to Associate or Full members are admitted to Associate membership (unless in the case of a deceased Full member the royalties over the last three years had fulfilled the criteria for Full Publisher membership). Once elected, Provisional Successor members are promoted to Associate membership status under the same criteria as living Writer members, and Associate Successor members are promoted to Full membership status in accordance with the criteria for Publisher members. Unless a Successor member is elected, IMRO’s control of the rights in unpublished works will cease upon the expiry of the seven year period following the death of the last surviving interested party in the works. As regards published works, payment to the publishers will normally continue after the expiry of the seven year period, and include the former Writer share. The executors of the last member would no longer be entitled to receive that Writer share direct. In conclusion, members should ensure that they have made a valid will specifically bequeathing their royalties (if appropriate), and to also include that a direction is given to close family and/or legal advisors to notify IMRO immediately after their death so that the above procedures can be put into effect swiftly. 1) The online works registration facility is available in the Member Services area of the website www.imro.ie. If the work is co-written, members must confirm to IMRO, via the online declaration, that they have notified all other contributors on the work that they are registering this work on their behalf and that all contributors agree to the share splits as indicated. Where members wish to notify several similar works, provided that the number of writers is the same and the contractual details and shares are identical, additional titles can be registered by using the Copy function on the work. Online works registrations are processed on a daily basis. 2) There are two types of paper forms which can be used to register works: a form for unpublished works and a form for published works. Unpublished work registration forms must be signed by all contributors on the work. Where members wish to notify several similar works, provided that the number of writers is the same and the contractual details and shares are identical, additional titles can be entered on the second page of the works registration form. Paper works registrations are processed on a weekly basis. 3) Work amendments must be submitted to IMRO on paper works registration forms. All original and new contributors to the works, for whom shares are being updated, must sign and date the amended works registration form. 4) IMRO follows international best practice where counterclaims or disputes arise in relation to the ownership of musical works. Where a new copyright owner claim conflicts with an existing copyright owner claim, then the new claimant must be able to support this claim with documentation within 60 days before that claim can be accepted by IMRO. In the meantime, IMRO will continue to pay the original claimant. If the new claimant can document its claim, then the original claimant has 60 days to produce documentation for its claim. If the original claimant has not answered within 60 days, they will be notified that their claim has been replaced by the new claim. If both parties maintain claim and can supply supporting documentation, then either party can seek to have the works placed in dispute and the relevant shares suspended pending agreement. As per IMRO Rule 6, Board approval is required to place a work in dispute. Published Works (i.e. works assigned to a publisher). 1) It is the responsibility of your publisher to register works you have assigned to that company. Published works should not be registered by the songwriter with certain exceptions. For example, a writer may wish to register works which are published abroad only or if there are works registration delays on the publisher’s side. 2) Writers who are under exclusive contract to a publisher should ensure that they advise their publisher of all new works as they are written to enable the publisher to register the works. 3) Should be registered with IMRO as soon as possible. Members can submit details of performance and recording activity online or when submitting the works to IMRO. 4) Each writer has a unique nine digit CAE Number. This number should be (legibly) entered in the appropriate column in order to correctly identify the writer. If you are co-writing with other IMRO members or members of affiliated societies, you should ensure that your co-writer’s CAE Number is also entered. If you are unsure of your CAE number, please contact IMRO Membership Services. 5) Members should not register their arrangements of copyright works as no share of royalties is allocated to an arranger in such cases. HOWEVER ARRANGEMENTS OF PUBLIC DOMAIN WORKS SHOULD BE REGISTERED. 6) If a composer has written incidental music for a non-musical play, the playwright’s name should not be shown in the author’s column. If songs have been written for the play, their individual titles and other details should be separately indicated, making it clear who wrote the words. 7) Specially commissioned works for a film, television or radio programme (or series) or any other audio-visual production should, wherever possible, be notified under the generic score title only (e.g. “Film X – Theme and Background Music”). It is not necessary to notify each individual cue employed in an audio-visual work, except where the nature of the cue differs substantially from the rest of the score (e.g. another interested party is involved, or the work is a commissioned song). If available, the producer’s music cue sheet for the production this should be sent directly to IMRO’s Distribution Team. 8) Performing shares must add up to exactly 100%. Mechanical shares must add up to exactly 100%. 9) In completing works registrations, members should indicate their preference for a US performing right society to collect royalties on their behalf; either ASCAP, BMI or SESAC. Where no choice is made by the member, the default choice is ASCAP. 1) All contributors to the work must be identified on the works registration. CAE numbers should be entered in order to ensure the correct contributor is credited. 2) When notifying Co-Published works or ‘Split Copyrights’, you are not required to indicate contractual details of interests other than that part of the work you are notifying. However, all interested parties, (i.e. all the names of writers and publishers involved with the work) and applicable shares must be shown. 3) All forms should always be signed and dated – for publishers’ notifications the full name of the publisher and the capacity of the signatories should also be provided. The names of all writer and publisher members are entered, by the Society to which they belong, onto an international membership database, known as the IPI. This generates a unique CAE number for each society member. To protect confidentiality where writers register a pseudonym or where publishers trade under a different company name, a separate CAE number is allocated. Therefore, members may have more than one CAE number. In order to ensure work contributors are correctly identified, we request members to quote their CAE number when registering works and agreement details. If you are unsure of your CAE number, please contact IMRO Membership Services. When registering a work, whether by a publisher or writer/composer, the IMRO member is declaring their copyright ownership of that particular work. Therefore, it follows that in the event of a dispute regarding ownership of works, the legal obligation rests with the publisher or writer/composer to prove ownership. This document provides an overview of how IMRO distributes the royalties it collects on behalf of composers, authors and publishers. IMRO collects royalties from a range of sources and this document explains in detail how and when the royalties from each source are paid to the copyright owners. This document should be read by IMRO’s members, IMRO’s affiliates (performing right societies outside of Ireland with whom IMRO has a reciprocal agreement) and IMRO’s customers and is intended to make IMRO’s royalty distributions as transparent as possible. Under the terms of IMRO’s license agreements, many of IMRO’s customers are obliged to report to IMRO the musical works that they have used e.g. played on radio or at a live concert etc. These lists are brought into IMRO’s Distribution System and matched against the almost 14 million works held on IMRO’s database. IMRO then uses this information together with information provided by its members, affiliate societies and third parties to identify the copyright owners of each musical work used and to calculate the royalties due. Wherever economically feasible, IMRO tries to ensure that the royalties received from each customer are paid directly on the basis of the musical works performed or broadcast by that user. Through the increase of electronic reporting from customers and the implementation of a new Distribution System, IMRO are processing ever increasing amounts of data in a cost-effective way. 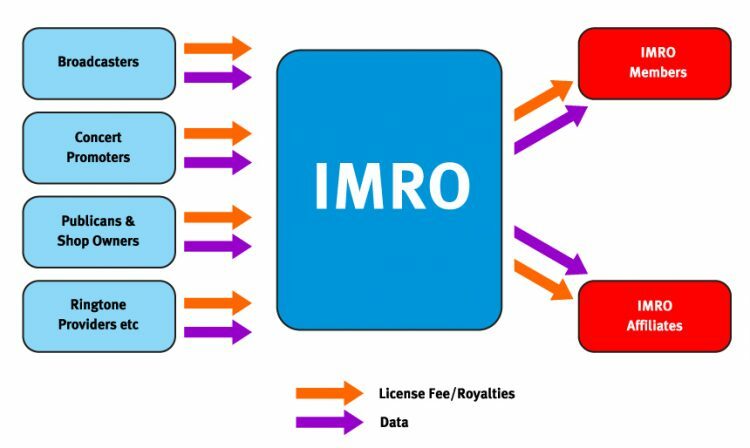 However, in some cases, the cost of processing the data will exceed the level of royalties collected; IMRO therefore uses a combination of techniques to distribute royalties. When distributions are carried out on a census basis it means that the royalties received from an individual customer are distributed 100% across the music used and reported by that customer. Most television and radio station royalties are distributed this way. Some radio stations play most music from a ‘play-out’ system; however they will often have a range of specialist programmes that are returned manually. If a station’s royalties are distributed on the Census/Sample rate, it means that they are delivering full census reports for all automated programming (i.e. 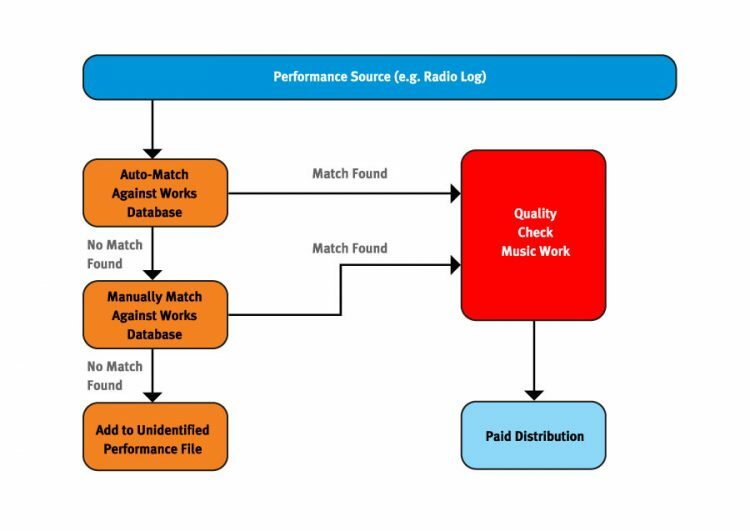 where music is played out using an automated/play-out system) and are on a sample rate for all programming not delivered via an automated system (i.e. incorporating specialist programming). This is where royalties from an individual customer are distributed using a representative sample analysis of its logs. All sample data is chosen on a random basis using a software tool. Royalties for most performances given by recorded means (CD, juke boxes, background music devices etc.) are distributed by reference to statistical data, obtained from sources other than the licensees and which reflect contemporary patterns of music use. These can include sales charts, transmission logs from certain broadcasters, cinema operators, representative surveys etc. This method is used extensively in broadcast distributions. The net royalty for a radio station is divided by the total number of seconds of music broadcast in the distribution period to arrive at a ‘Point Value’ (the value of music per second). This ‘Point Value’ is then multiplied by the number of seconds reported by the broadcaster to calculate the royalty value for that particular song. This method is used most often in distributions related to live performances. The net royalty for a specific distribution pool is divided equally amongst all musical works performed. This document gives a comprehensive view of where each distribution technique is used across the range of IMRO’s revenue streams. IMRO receives royalties from all Irish broadcasters. In the main the royalties from broadcasting are analysed on a Census basis where music duration is a key factor in determining the value of a royalty payment. The process for all surveyed broadcasters is as follows. This split will be reviewed every 5-7 years. It was last assessed in 2011. There are 5 national TV stations in Ireland: RTÉ 1, RTÉ 2, TV3, TG4 and UTV Ireland. Each station returns complete transmission logs and these are analysed on a census basis. The royalties received from each station are distributed four times a year. A separate distribution pool is created from each station and the royalties received from that station are distributed across the music reports returned by that station. 85% of the net revenue received is distributed across ‘General Music’ i.e. the music used within all TV programmes, promos etc. 15% of the revenue in each station is reserved for an ‘Advertising Music’ pool as the music returns for adverts are processed separately. There are very few indigenous cable-only stations in Ireland. Where economically feasible, IMRO’s policy is to distribute royalties on a census basis. IMRO licenses cable operators and satellite broadcasters for the cable re-transmission of foreign stations in Ireland. IMRO passes the royalties it collects for these stations to the society in the territory of original broadcast e.g. the royalties collected by IMRO for the re-transmission of BBC channels is passed to PRS which is then added to the main BBC PRS pools. The following is a selection of channels licensed by IMRO where the royalties are distributed by the societies in the original territory. As per international agreements IMRO can reserve a percentage of this Cable Re-Transmission net revenue to compensate IMRO original and sub-publishers who otherwise would not feature in the distributions in the territory of original broadcast. IMRO currently reserves 2% of net revenue to fund a Publisher Compensation Scheme. On an annual basis, IMRO writes to its publisher members inviting them to take part in the scheme. To qualify the publisher must be able to show how it is at a financial loss due to the cable re-transmission royalties being distributed by the overseas society rather than IMRO. The member’s earnings from IMRO’s domestic TV distributions are used to determine the share of the compensation fund. A simple weighting is also applied to reflect whether a member earns reduced or no royalties due to the overseas society carrying out the distribution. There are 6 national/quasi-national radio stations in Ireland: RTÉ Radio 1, RTÉ Radio 2FM, Radió Na Gaeltachta, Lyric FM, Today FM and Newstalk. Each station returns complete transmission logs and these are analysed on a census basis. The royalties received from each station are distributed quarterly. A separate distribution pool is created for each station and the royalties received from that station are distributed across the music reports returned by that station. The advertising logs for each of these stations are processed separately. 15% of net revenue is reserved to fund each advertising distribution pool (with the exception of RnaG as it carries no advertising). There are 30 Regional, Multi City and Independent Local Radio stations in Ireland. The royalties received from each station are distributed four times a year. A separate distribution pool is created from each station and the royalties received from that station are distributed across the music reports returned by that station. To improve the accuracy of distributions relating to music used in radio advertising, 9% of revenue from all Local, Multi-City and Regional stations is reserved to fund the ILR Agency pool. The ad logs from a number of national stations are used as the basis on an analogy to distribute this revenue. There are 6 digital radio stations in Ireland. As digital radio is in its infancy in Ireland and as the revenue received from this source is very modest no direct distributions take place. At present, no advertising is carried on these stations. There are a range of community radio stations and other stations that will from time to time receive temporary broadcast licenses. The revenue from these stations is distributed 50% across the RTÉ Radio 1/Lyric/RnaG General Music pool and 50% across the RTÉ 2FM General Music pools. Mainstream cinema royalties are distributed on the basis of box office figures returned by Rentrak EDI. Rentrak EDI collects box-office information from all cinema operators in Ireland and compiles the official box-office charts. The relevant cue sheets are secured from IMRO’s members and from IMRO’s affiliates. The mainstream cinema pool is made up of 90% net revenue received from all cinemas in Ireland (excluding the IFI Cinema in Dublin). Revenue from the IFI Cinema in Dublin makes up the Arthouse cinema pool. 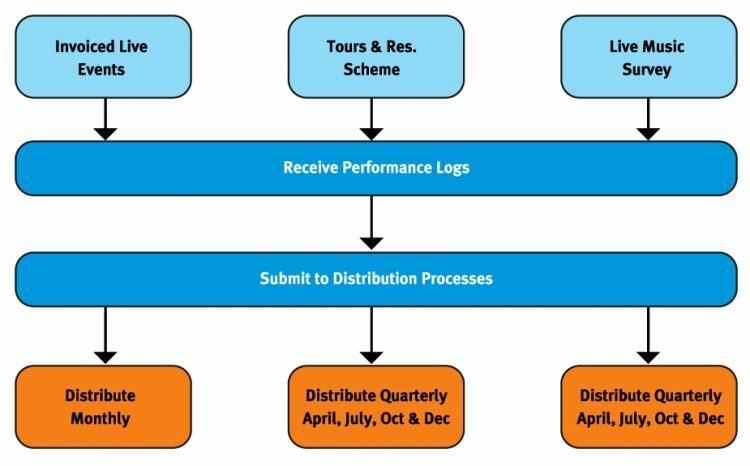 The royalties are distributed on the basis of performance logs returned by the IFI. Cinema advertising royalties are distributed on the basis of advertising logs provided by Wide Eye Media which has 100% site coverage in Ireland through all the major cinema exhibitors and through many independent operators. As with broadcast royalties, IMRO strives to distribute as many live royalties as possible across actual usage data. The frequency of live royalty distribution ranges from monthly to quarterly depending on the source of the revenue. Invoiced Live Events are gigs and concerts where a specific invoice has been raised for the event. On these occasions, IMRO will ring-fence the royalties collected for distribution across the actual set-lists used at the event. IMRO collects set-lists from music promoters, members and sister societies. Once the set-list has been received and the invoice has been paid, IMRO distributes these royalties within a month. If after a three year period IMRO has been unable to secure a relevant setlist, the royalties are distributed via the Live Music Survey. From January 2015, a threshold of €24 will be applied to invoiced live events. This will result in events under this threshold being distributed via the Tours & Residencies Scheme upon submission of qualifying performances via the IMRO website. The Tours & Residencies scheme allows IMRO’s members and affiliates self-report all gigs they have performed in a quarter. The members and affiliates are required to submit both a Gig-List (a list detailing the date and venue of their performances) and a representative Set-List that includes all songs regularly performed. From January 2012, members must submit qualifying performances via the IMRO website. A fixed cost of 10% will be applied to this scheme. The royalties collected from all other live performances (i.e. not specifically invoiced or Tours and Residencies performances) are distributed on the basis of IMRO’s Live Music Survey. This survey of live performances in pubs, hotels & restaurants around the country is carried out on IMRO’s behalf by an independent market research company. There are a number of safeguards in place to ensure the validity, accuracy and representativeness of the survey. 9 months worth of survey data is used in any distribution period. Performances of these groups are licensed via annual blanket license with RTÉ. The royalties from a range of sources for ‘background’ music is distributed over a number of different analogies. Generally background uses are made up of the public performance of Radio or Television in a premises or by mechanical means, e.g. CD, Tape, MP3 player etc. An analogy is a statistically sound and cost effective way to ensure that the correct mix of music is reflected in royalty payments to writers and publishers. These analogies are devised by first carrying out a survey of actual usage in the relevant type of premises e.g. Shops and Bars and then comparing the results with data already available to IMRO using an independently commissioned mathematical formula; this data will include sales charts, transmission logs from certain broadcasters etc. This comparison seeks to find degrees of similarity between the music captured in the actual survey and the data IMRO already has to hand. The analogies are reset every 5-7 years following a fresh survey of actual usage. The Background Music analogies are next due for review in 2018. This refers to the public performance of music by means of a television or radio by an IMRO customer. Where an IMRO customer pays a TV tariff, the royalties are added pro-rata to all licensed television station pools (including cable re-transmitted channels) and distributed as part of the quarterly broadcast distribution. Where an IMRO customer pays a Radio tariff, the royalties are added pro-rata to all licensed radio station pools and distributed as part of the broadcast distribution in April, July, October and December. Where an IMRO customer pays a combined background tariff e.g. for the use of a CD player and/or a radio and/or a TV, then two-thirds of this revenue will be treated as recorded revenue and distributed on the same basis as ‘Background Music – Shops & Bars’ (see below) while one-third will be added pro-rata to all licensed television and radio station pools (including cable re-transmitted channels) and distributed as part of the broadcast distribution in April, July, October and December. Where an IMRO customer (shop owner or pub owner) pays a background mechanical tariff for the use of a CD player, MP3 player or juke-box etc. then the royalties are distributed via the Shops & Bars analogy. Where an IMRO customer (hotel owner or restaurant owner) pays a background mechanical tariff for the use of a CD player, MP3 player or juke-box etc. then the royalties are distributed via the Hotels & Restaurants analogy. A specific analogy is used to distribute royalties collected from Commercial Discos. IMRO distributes royalties collected from a range of local MSPs (Music Service Providers). Given the emergent nature of this market and the large volume of data to be processed, general distribution policies are set but are reviewed on a case by case basis. IMRO has partnered with a number of affiliated societies (PRS, SACEM) to offer licenses to multi-territorial MSPs. Therefore for pan-European services, IMRO members will receive the majority of their digital royalties as overseas income. All reported downloads from licensed MSPs are ‘auto-matched’. Unmatched downloads that have been sold three times or more will be ‘manually matched’. The total royalties collected will be distributed across all matched downloads. All reported ringtones from licensed Ringtone Providers are ‘auto-matched’. Unmatched ringtones that have been sold two times or more will be ‘manually matched’. The total royalties collected will be distributed across all matched ringtones. All reported tracks that have received greater than a 200 streams in a quarter from licensed MSPs are ‘auto-matched’. Unmatched tracks that have been streamed 500 times or more will be ‘manually matched’. The total royalties collected will be distributed across all matched streams. Given the extremely high volume of data returned by licensed on-demand streaming services, it is not practical to attempt to match all data. This policy is kept reviewed regularly as new providers come online. IMRO is committed to forwarding international royalties to its members in the shortest possible time. With 12 payment runs a year (January to December), IMRO is at the forefront internationally of providing the most frequent distribution of overseas royalties to its members. All royalties received from an overseas sister society before the 20th of a given month are forwarded to our members by the 15th of the following month. IMRO is a member of CISAC (International Confederation of Societies of Authors and Composers), an umbrella group for collecting societies. As a member IMRO has signed up to CISAC’s professional rules; a code of conduct covering areas such as Governance, Membership and Transparency. In relation to Distribution, the Professional Rules set out a range of Binding Resolutions and Best Practices that IMRO fully adheres to. If at the time of distribution, there is inadequate documentation for a work that has been performed or broadcast but if one of the original rights holders can be identified as belonging to one of IMRO’s affiliated societies, then all the royalties accruing to the work must be forwarded to that affiliated society. That receiving society will then be responsible for carrying out the distribution and for providing IMRO with adequate documentation for future distributions. There is only one exception to the application of the Inadequate Documentation rule. That is where an identified original rights holder is an IMRO member. In that circumstance the royalties owing to the work will be placed in suspense and IMRO will contact its member to secure the correct documentation. An unidentified use is a performance that cannot be matched to any documented work by IMRO and therefore cannot be distributed via the ‘Inadequate Documentation’ rule. In this scenario, the unidentified performances are placed on the UP File. The UP File is provided to affiliated societies in an agreed format and is also made available to IMRO’s members via the secure member area of the IMRO website. IMRO members who log-on to the website can search for any works that they believe were performed but have not received a payment for. Each unidentified performance on the UP file holds a notional value (the royalty it would have secured had it been identified at the time of distribution). A member can claim a performance by linking it to their relevant work and following validation by IMRO staff a payment will be made at the next available distribution. Unidentified Commercials refer to advertisements with music but where the music was unidentified at the time of distribution. In this scenario, the unidentified commercials are placed on the UC File. The UC File is provided to affiliated societies and also made available to IMRO’s members via the secure member area of the IMRO website. IMRO members who log-on to the website can search for any commercials that they believe were performed but have not received a payment for. Each unidentified commercial on the UC file holds a notional value (the royalty it would have secured had it been identified at the time of distribution). A member can claim an unidentified commercial by linking it to their relevant work and providing supporting information e.g. clock numbers. Following validation by IMRO staff a payment will be made at the next available distribution. In the event of IMRO paying a work incorrectly or paying incorrect share splits on the work, then IMRO will carry out a Debit/Credit Adjustment. Following validation from IMRO staff, the royalties will be debited from the incorrect copyright owners and paid to the correct owner. 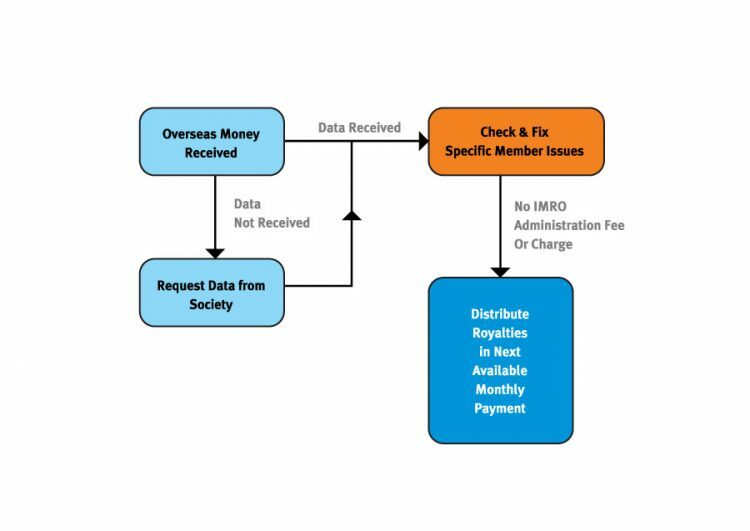 Once notified of an incorrect payment, IMRO will carry out the necessary Debit/Credit Adjustment by the next available quarterly distribution. As per international standard, IMRO does not process adjustments for claims made more than 3 years after the original distribution. If at the time of distribution, there is inadequate documentation for a work that has been performed or broadcast and none of the contributors can be identified, then the royalties due to that work are held in suspense i.e. the amount due to the work is reserved for a time to enable identification of the copyright owners. All suspense amounts are reviewed after a 6 month period to attempt to identify the correct copyright owners. Copyright owners who are successfully identified will receive a payment at the next available quarterly distribution. If after analysis, the correct copyright owner cannot be identified, then the royalties are returned to its relevant revenue pool for future distribution e.g. if the unidentified copyright owner featured on a work played on Today FM, then that unallocated royalty would be added to the Today FM pool at its next distribution. IMRO follows international best practice where counterclaims or disputes arise in relation to the ownership of musical works. Where a new copyright owner claim conflicts with an existing copyright owner claim, then the new claimant must be able to support this claim with documentation within 60 days before that claim can be accepted by IMRO. In the meantime, IMRO will continue to pay the original claimant. If the new claimant can document its claim, then the original claimant has 60 days to produce documentation for its claim. If the original claimant has not answered within 60 days, they will be notified that their claim has been replaced by the new claim. 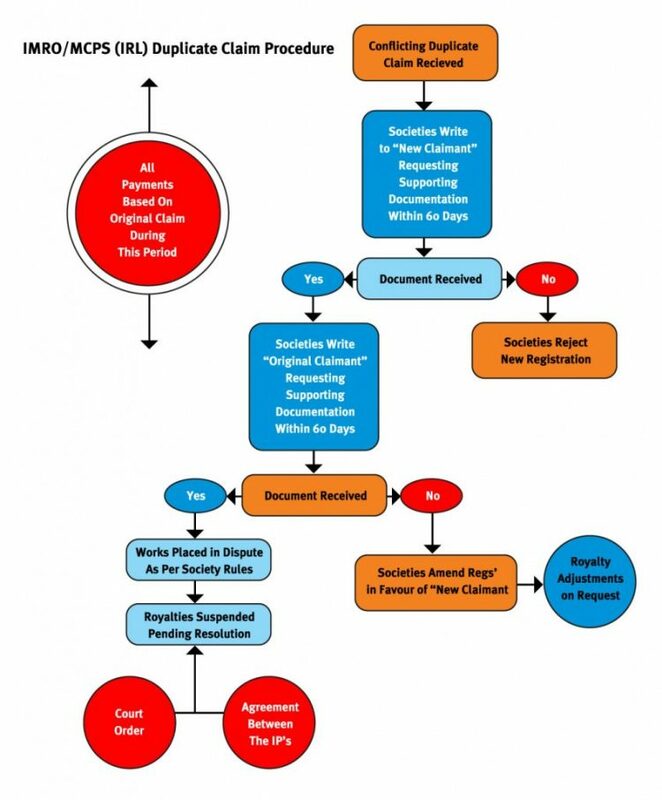 If both parties maintain a claim and can supply supporting documentation, then either party can seek to have the works placed in dispute and the relevant shares suspended pending agreement. As per IMRO Rule 6, Board approval is required to place a work in dispute. IMRO does not and will not arbitrate in the matter of disputes between interested parties and it is not IMRO’s responsibility to determine which of the claimant’s documentation is more correct or valid. 02/12/2010 IMRO Board Revised ‘Census/Sample’ definition. 03/05/2011 IMRO Board Revised RTÉ TV & Radio policies; changes to cinema policies to use Rentrak EDI & Carlton Screen Advertising data; new Video Streaming policy. 14/09/2011 IMRO Board Revised RTÉ Performing Groups policy. 30/11/2011 IMRO Board Revised Tours & Residencies scheme; revised cable re-transmission policy; creation of ILR Agency Ad policy. 14/03/2012 IMRO Board Revised Music Streaming and RTÉ Player policies. Irish Copyright legislation does not attempt to define what constitutes a performance in public. The general rule which has emerged from decisions by the Courts over the years, though, is that any performance which takes place outside the domestic or quasi-domestic circle is ‘public’ for this purpose regardless of the nature of the entertainment or the kind of premises where the performance takes place, and irrespective of whether a charge for admission is made. For example, performances in clubs at which attendance is restricted to members, and performances in factories, have been held to be public performances for the purpose of the Act. Through assignments from its own members and through affiliation agreements with foreign societies, IMRO owns or controls the public performance right in most of the copyright music played in Ireland. Its licence is therefore necessary for practically every public performance of copyright music in this country. IMRO’s policy is to grant a licence to any prospective music user provided only that the person concerned is prepared to enter into the standard licence contract and pay the appropriate tariff royalty. The copyright in a work is infringed by a person who without the licence of the copyright owner, undertakes or authorises another to undertake a public performance of that work. The onus therefore lies on a music user and venue owner to obtain the permission of the copyright owner before public performances begin. Since IMRO controls the performing right in the musical works vested in it by copyright owners, it maintains nation-wide staff in the field to explain this obligation to unlicensed users of copyright music and to issue licences to them. Licences are also issued directly by the IMRO Head Office. The tendency of music users not to seek an IMRO licence until approached by its IMRO staff means that the cost of issuing new licences is high. For this reason, unless the music user asks for a licence before being approached by IMRO staff. the royalty for the first year of a licence is 50% higher than the subsequent years charges. IMRO is reluctant to litigate with music users who do not comply with the law and it takes all reasonable steps to ensure that music users are fully aware of their obligations. However, if a music user refuses to enter into a licence after the legal obligations have been fully explained to him/her, copyright infringement proceedings are begun in the Circuit Court. These proceedings seek an injunction preventing the performance of any of IMRO’s copyright repertoire in public until a licence is obtained and paid for, and IMRO also claims damages and costs. IMRO licences are in the form of contracts which run from year to year until cancelled by either party. They are blanket licences, authorising the public performance of any of the millions of works which IMRO controls on behalf of both its members and the members of its affiliated societies throughout the world. The royalties payable under IMRO licences vary depending on the nature of music usage on the premises concerned. The general nature of the licence contract is that it authorises the licensee to perform, or to cause or authorise the performance of IMRO’s copyright repertoire, in consideration for which the licensee undertakes to pay the appropriate royalty. Naturally, it does not oblige the performance of all or any part of IMRO’s repertoire. The extent to which that repertoire is performed, within the terms of the licence, is the licensee’s choice entirely. It would obviously be quite impracticable for IMRO to monitor every performance given by each of its licensees, just as it would be intolerable for most licensees to keep a precise check on the nature and extent of all performances in their premises. Therefore, IMRO must be told immediately in writing of any reduction in music usage levels if it is to agree to a corresponding reduction in the royalty. Similarly, increased music usage must be promptly notified to IMRO by licensees. IMRO’s licences cover both ‘live’ performances and performances by mechanical means, e.g. juke boxes, radio and television, video, record, CD, tape players, MP3 players, etc. Licences are in issue for numerous categories of premises, including cinemas, clubs, concert halls, discos, town halls, church halls, public houses, restaurants, shops, factories, universities, ships, aircraft, sports stadia, theatres and many others. Nearly 30,000 establishments hold an IMRO licence in Ireland. In certain cases, permits (or one off licenses) are issued for the use of IMRO’s repertoire, or sometimes for specified works, either at a single performance or at a short series of performances at premises not licensed for those performances. If a copyright musical work is performed in public without the copyright owner’s consent then the copyright owner has a claim against not only the promoter of the performance but also the proprietor of the premises (unless he can show that he had no reason to believe that copyright infringement would take place) and the performers. It is not IMRO policy to grant licences to performers (other than to brass and military bands as such, for performances in public places). IMRO normally issues its licence to the proprietor of the venue concerned, so relieving the promoter of a musical entertainment at that venue from having to apply for a special permit licence. Promoters should make a point of ensuring that the proprietor holds an IMRO licence which will cover the occasion, when hiring a premises for a function involving the use of music. Where a business operating multiple premises needs a licence, IMRO may issue a single licence to the Head Office of the company concerned. Royalties are then assessed depending on music usage and the number of premises involved. Since the licence is a contract it follows that the payment of royalties is an obligation enforceable by law. Those who remain in default after due reminders are issued, are sued in the appropriate courts as ordinary commercial debtors. Royalty charges payable by licensees are calculated under a series of carefully devised tariffs which normally take account of the type and frequency of the performances, the nature of the venue and other relevant circumstances. Many tariffs have been set after consultation with national associations representing the classes of music user to whom they apply. As explained earlier, IMRO’s charges for the first year of a licence are 50% higher than the continuing royalty, unless the licensee sought that licence from IMRO before the relevant performances began. IMRO’s principal tariffs are adjusted annually for inflation. The annual adjustment is by reference to movements in the Consumer Price Index. Many IMRO licensees pay a flat annual charge which does not need to be adjusted from year to year, other than for inflation. These include most premises licensed only for background music. However, where the royalties are calculated as a percentage of admission receipts, or the number of employees (as in the case of factories and offices) or on a fluctuating number of live performances, dances, discos, or other events with music, then in fairness to both IMRO and the music user, the licensee may be asked to complete an annual return of the music usage so that the correct charge can be established. Royalties are payable annually in advance. A licensee whose royalty is calculated and adjusted annually therefore pays, in the first year, an amount based on an estimate of the licensee’s music usage during the coming year. At the end of the year this payment is adjusted to the actual figure by reference to the returns sent in by him. For the ensuing year the licensee pays the equivalent of the royalty calculated for the previous year, that payment in turn is then adjusted twelve months later when the actual details can be ascertained. Licensees must inform IMRO of changes to performance particulars within latest 1 month of the end of year period to which the change relates, otherwise IMRO is not in a position to make an adjustment to the liability owed. Details of the scope and cost of IMRO tariffs may be obtained from the Licensing Department or on https://www.imro.ie/music-users/imro-tariffs/. Tariffs contain up-to-date information on the actual charges levied and many are subject to periodic review. Most tariffs provide for automatic increases in line with the cost of living increases. The extent of the rights administered by IMRO on behalf of its members is regulated by detailed provisions in IMRO’s Articles of Association and in special directions issued by the Board of IMRO pursuant to the Articles. These definitions are long and somewhat complicated, but their general effect in practice is as follows. Subject to the exceptions explained in the next paragraph, IMRO administers the performing right in all its members’ musical works; and the term ‘performing right’ means the right (a) to perform a work in public, (b) to broadcast a work and to cause the work to be transmitted to subscribers to a diffusion service. IMRO also administers the film synchronisation right in any musical work specially written by a member for a film. (c) to cause the work to be transmitted to subscribers to a diffusion service, in so far as such rights subsist under the law in force from time to time relating to copyright in the State, and includes such corresponding or similar rights as subsist under the laws relating to copyright in all other countries in the world as in force from time to time. (e) any other words (or part of words) which are associated with a musical work (even if the musical work itself is not in copyright, or even if the performing rights in the musical work are not administered by the company). NB The assignment to IMRO of the film synchronisation right by a writer member is subject to the express provision that IMRO will at any time, at the request of the composer or author of the work, assign or licence the film synchronisation right in the work to the film producer or other person who commissioned its composition or writing provided that IMRO shall have obtained from the producer of the film on the soundtrack of which the work is to be recorded, an agreement in a form satisfactory to IMRO providing for payment to IMRO of such fees either by way of a lump sum payment or share of receipts of royalties or otherwise as IMRO may require in respect of any exhibition of any film embodying the work in cinemas (motion picture theatres) in the USA. Note: At the option of the member who is the owner of the copyright in a dramatico-musical work IMRO may administer the broadcasting right in a dramatic excerpt or excerpts from the dramatico-musical work broadcast in a documentary programme where non-dramatic excerpts from the dramatico-musical work also appear in the same programme and where the total duration of all the excerpts in the course of the programme does not exceed 20 minutes. Note: At the option of the member who is the owner of the copyright in a ballet, IMRO may administer the broadcasting right in a part or parts (being less than the wholes of the ballet broadcast in a documentary programme where the total duration of all the parts in the course of the programme does not exceed 20 minutes). 3. words written for the purpose of a commercial advertisement unless such words are sung to music specially written for a commercial advertisement or to non-copyright music and the sung performance has a duration of not less than five seconds. 2. words written for the purpose of a commercial advertisement unless such words are sung to music specially written for a commercial advertisement or to non-copyright music and the sung performance has duration of not less than five seconds. 4. any musical work (being a musical work which is not a dramatico-musical work or part of a dramatico-musical work) specially written for production of a dramatic work in a theatre when performed in or in conjunction with that dramatic work. The right to include in a cable programme service or to broadcast by microwave distribution every musical work of which the member is the writer, publisher or proprietor except words written for the purpose of a commercial advertisement unless such words are sung to music specially written for a commercial advertisement or to non-public domain music and the sung performance has a duration of not less than five seconds. In the case of a writer member only, the film synchronisation right in every work composed or written by the member primarily for the purpose of a particular film or films in contemplation when the work was commissioned. 1. If an excerpt from a dramatico-musical work is performed on television or on stage it will be deemed to be dramatic if it is accompanied by any dramatic action, whether acted, danced or mimed, and thereby (and/or through the use of costume, scenery or other visual effects) gives a visual impression of or otherwise portrays the writers’ original conception of the work from which the excerpt is taken. c) scenic effects are limited to the use of either a single prop, and/or a backcloth or a piece of scenery (whether physically present or created by technical means e.g. lighting effects) provided that the use thereof is not combined with costume from or based on the dramatico-musical work from which the excerpt is taken. (1) IMRO also controls the cable re-transmission of such works when the act of re-transmission derives from and is simultaneous with a broadcast of the work by radio or television. However, the circumstances in which such simultaneous re-transmission constitutes a ‘restricted act’ which can be licensed by or on behalf of the copyright owner are somewhat limited. (2) Guidelines to help determine whether any given performance of such an excerpt is ‘dramatic’ or ‘non-dramatic’ have been adopted by the Board of IMRO. (3) ‘Film’ is defined as in Section18 of the Copyright Act 1963 (see paragraph 10 on page 71). It thus includes videograms (whether in the form of cassettes or discs) as well as films in the narrower sense. (4) Broadcasting by microwave distribution is the technique by which television or sound services may be distributed, in a specified area, to homes or other places having special aerials capable of receiving microwave signals.